I made the original version of this tool a while ago and it was made very quickly just as a favour for someone that wanted something simple that could show them the members of the local Administrators group on several remote computers. Today I finally got chance to update and improve it. The full list of changes between this and the original version can be found here, but the most noticeable change will be the redesigned user interface. 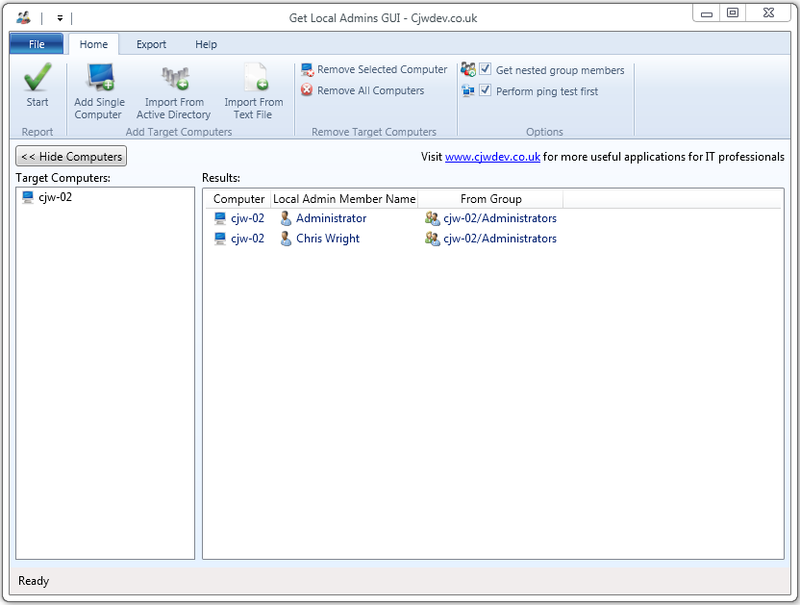 It is still intended to be simple and easy to use, so all you need to do is enter the names of the computers you want to query (or import them from an OU in Active Directory, or from a text file) and then run the report. The program will then query each computer remotely and show you the members of the Administrators group on each of them. You will also see any members of nested groups within the Administrators group (although you can now turn this option off if you only want to see the direct members). The results can then be exported to CSV file or HTML file with the click of a button. Like I said, when I first made this tool it was just a favour for someone that wanted a GUI alternative to all the scripts and command line tools that can get this kind of information. I wasn’t really even planning on putting it on my website for other people to use, but then I thought even if only a few people download it and it helps them out then its still worth putting it up there. I’ve been surprised how many people do use it, so I decided it was time to update it and make it more in line with the look and feel of my other applications (as well as adding a few new features). Anyway, hope it continues to be useful to people and I’ll be posting another blog post about my latest project very soon. It is nice you thought to have a GUI alternative despite all the scripts. I’ve checked in on the site on and off since I began in IT about 6 months ago and I was just wondering, you really quit your job? I mean that’s awesome you’ve had success, I’m 24 too and I always wondered if the niche was large enough. The software license management tool is still being worked on, but won’t be the next tool I release I’m afraid. Can we see the script behind this? Well its not a script, its a full .NET program. So there’s a few hundred lines of code behind this. Is there a particular part of it you’re interested in seeing the source code for? Hi, it would be very helpful to me (and I’m sure others as well) if you added the ability to enumerate all group members rather than just the local administrators group and add the ability to run this from a command line and export the data to CSV. 🙂 Keep up the great work! Thanks 🙂 I didn’t add any command line functionality because there are already plenty of scripts and examples out there that will do that for you – I made this tool because there were not any GUI alternatives to scripts. If you want a command line method then google it and you’ll find plenty 😉 As for enumerating other group members, do you mean other local groups or are you talking about AD groups?